This fantasy short story includes explicit text, mature themes, and sexual situations. After two spice merchants sell their ships to pay a dowry to the Althasian nobility, they send their only daughter to Castle Althasia for her vetting. Esmeralda believes she is to wed the handsome Prince of Althasia, but when he reveals that he is a man trapped in a dragon's body, she runs screaming from the castle and vows never to return. But the money between the king and her parents has already changed hands and the deal is done. When she finds out that her head could be on the chopping block for breaking the contract, she decides to make the best of her situation and try to love the prince for all of his green scales. Will Esmeralda and the prince fall for each other and break the curse? Or will Prince Edgar, the servants, and Castle Althasia be cursed for an eternity? Lair of the Dragon Prince is a story retelling of a beauty and her beast. 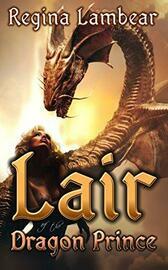 It includes dragons, humor, romance, royalty, fairy tales, and new adult themes.